For Fall 2019, Vancouver, Canada-based Herschel Supply has partnered with Xiamen-based Chinese designer Shangguan Zhe on a collaborative range of multi-functional carryalls for SANKUANZ’ Autumn/Winter 2019 runway collection. The collaboration between Herschel Supply and SANKUANZ is tailored closely to the concept of the brand’s runway theme – Drown 52, a fictional diving squad, diving down to the deep ocean to explore the unknown, like netizens surfing the internet or individuals passing through the ups and downs of society. The products highlight the standing military feel with accents on elements of attack and defense. 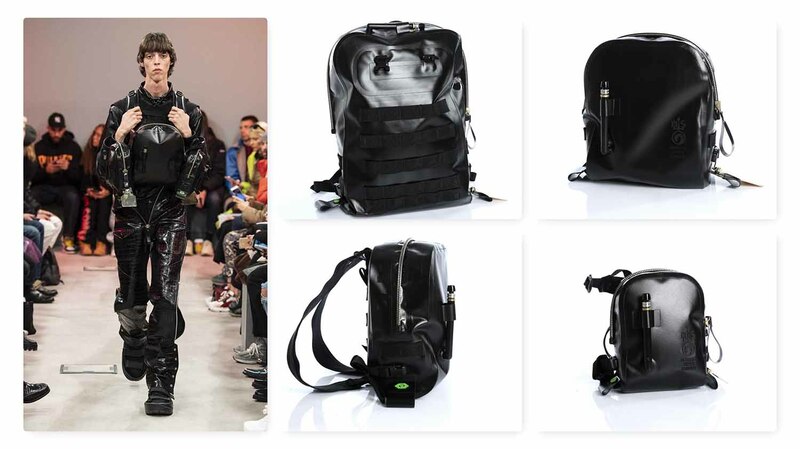 Inspired by military scuba equipment, the covert line consists of three silhouettes in various sizes: a large backpack, a mid-sized backpack that also functions as a chest rig, and leg pack that doubles as a crossbody. Each versatile piece can be attached together and worn as a full set or styled individually. Fabricated from durable water-proof and air resistant welded tarpaulin, all styles are outfitted with a gamut of hard-wearing gear and apparatuses including a fully-functional air pressure nozzle and inflatable buoyancy system, developed for scuba divers. Each bag is equipped with a MOLLE (Modular Lightweight Load-carrying Equipment) system that uses the same patented PALS (Pouch Attachment Ladder System) webbing utilized by various military forces including the United States Army. The front and back face of each bag are stitched with rows of heavy-duty nylon, allowing each to be interchangeably and securely attached to one another. The large pack and mid-sized pack feature an inner detachable organizer that also takes advantage of the convenient highly effective MOLLE system. Finishes include YYK PROSEAL technology zippers that offer a watertight seal, SANKUANZ branded metal plate accessory, high gloss SANKUANZ screen printing, green rubber sea dragon emblem, and a direct injected molded Herschel Supply Company x SANKUANZ logo. Combining the initials of each brand with the sea dragon, the emblem, specially designed for this distinct collaboration, embodies marine aesthetic and challenging spirits. The limited Herschel Supply x SANKUANZ collection will be available on herschel.com and via select global stockists later this Fall.